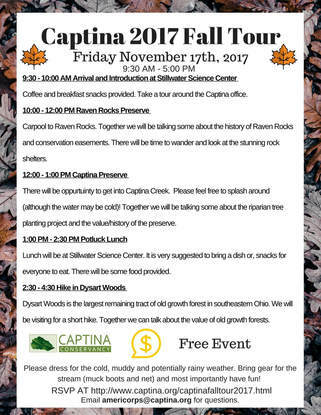 Please join us at the Stillwater Science Center for a tour of Captina Creek's prized gems. If you've never been to Captina Creek please take advantage of this day! There will be a total of three stops. Together we will carpool to Raven Rocks, Captina Preserve and Dysart Woods. Raven Rocks is 1,268 acres of rolling land in Southeastern Ohio. Much of the land is wooded and 1,015 acres has recently been placed under a conservation easement with Captina Conservancy. Captina Preserve is a privately owned property within the Captina Creek Watershed. It is home to a beautiful cabin and some of our riparian tree planting project. It's beautiful with easy access to Captina Creek. Dysart Woods, a 50-acre tract of old-growth oak forest located in Belmont County, is the largest known remnant of the original forest of southeastern Ohio. Through the centuries the trees and other vegetation, the soil, and associated generations of animals have lived and died with very little disturbance. An occasional log was obviously removed from a damaged or wind-thrown tree, but for the most part the woods qualify as a virgin forest. There will be quite a bit of hiking and an oppurtuinty to get into Captina Creek. Rich Sidwell will be the guest speaker of the day. Together we will all be talking about conservation easements and our riparian tree planting project. There will be a potluck lunch with some food provided. There is limited parking and it is suggested to carpool to/from the Science Center. Bring dish/food for everyone to eat and any other items deemed necessary. Please consider weather and dress appropriately. Bring gear for stream exploration. There is no cost for this event but it is suggested to donate $10. Please fill out the form below if you hope to attend the Captina Fall Tour.